"If you wrote a book and it sold 100,000 copies, it would be a best-seller. But in the record business, on a major label, that is a failure." My first encounter with Luna occurred during my work at the college radio station in Columbia, Missouri during the mid '90s. Former Galaxie 500 singer Dean Wareham formed the band in 1991, and the lineup underwent several major changes over the years. Often compared to The Velvet Underground, Luna delivers sharp pop tunes bolstered by Wareham's ear for melody and unique voice. Their successful blend of artistic style and accessible tunes has made them a personal favorite for many years. The band's final incarnation included Wareham, longtime guitarist Sean Eden, drummer Lee Wall, and bassist Britta Phillips, the group's newest member, who joined in 2000. Luna ultimately decided to call it quits in 2004, and documentary filmmaker Matthew Buzzell joined them on the final tours to chronicle their experiences. The result is Tell Me That You Miss Me�a sweet, realistic depiction of both the enjoyment and difficulties faced by touring rockers who fall just below mainstream success. Instead of providing a straightforward group history, Buzzell utilizes the "fly on the wall" approach and shoots the band in all types of situations. Much of touring includes long, tedious journeys on planes, trains, and vans at all hours of the day. This life can harm even strong friendships and create strain between normally amiable people. Luna's members appear to like each other, but their differing personalities do start to grate on each other during the years of touring. Eden is the fun-loving guy of the group and enjoys drinking in local pubs following gigs. This leads to some pretty crazy stories, which can get old when retold many times on the tour van. Wareham appears to like Eden, but his style is much different and does lead to some minor conflicts. On the stage, their guitar playing combines effectively and leads to great performances, but disagreements do arise during the downtime. Thankfully, nothing here even comes close to the crazed antics displayed in Dig!. Luna's four players do get along well and seem especially down-to-earth for such a heralded act. Although Luna has earned numerous critical accolades, they have fallen short of gaining the big status expected by many observers. Why is the case? Their music is fairly accessible and contains catchy hooks, and the members do exude an impressive stage presence. This question in a bit unfair, as the corporate marketing giants play a larger role today than journalists' praise. While playing theaters in Europe and Japan, they often end up in smaller clubs here in the States, where Clear Channel and other radio giants dominate the airwaves. This film effectively tackles the business side, with Eden clearly describing the lowly financial expectations of the European tour. The ticket prices cover the travel and equipment expenses, and the only revenue comes from t-shirts and CDs. Without a gigantic record deal, amazing bands across the world face this same dilemma. It's a sobering look at the big-business dominance of the music world and is conveyed well in this story. While tackling these serious issues, Buzzell also presents the enjoyable side of playing music around the world to charmed audiences. Luna may not have a huge fanbase, but their devotees are a strong group and will travel far to see them. This film showcases the positive energy generated by the live concerts, which send the obsessed fans into a dancing frenzy. Live clips from numerous classic songs appear to draw a few new listeners to the band's recordings. Highlights include the harmony-driven Friendly Advice; upbeat Speedbumps; 23 minutes in Brussels, which includes the lyrics from the film's title; and the Harry Nilsson cover Everybody's Talking, the fitting last song of their final concert. 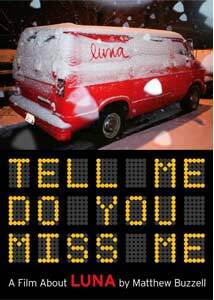 Tell Me That You Miss Me offers a worthy document of Luna's final tour and is successful largely due to Buzzell's impressive direction. He captures throwaway moments that might seem unimportant but actually provide a more defined picture of the band members. Lee Wall remains quiet most of the time, but his silent, unexpressive demeanor is poignant while he watches Wareham and Eden speak incessantly. Phillips' scenes while clothes shopping in Japan and interacting with locals are as important as her time on stage. Buzzell takes his time and finds memorable shots without worrying about sticking to the central story. This deliberate tone may be distracting for some, but for me it helped to create an immersive viewing experience. Luna's tenure may be over, but this picture will remain to offer essential snapshots from their final months. Image Transfer Review: Tell Me That You Miss Me utilizes a solid 1.66:1 anamorphic widescreen transfer that effectively conveys the digital video images. The concert footage isn't pristine, but it does give you the feeling of watching Luna inside a crowded club. The picture contains some grain, but that adds to the intimate environment generated by the film. The shots are clear and help Buzzell to offer a unique perspective on the touring life. Audio Transfer Review: This release includes a 5.1-channel Dolby Digital transfer that helps to deliver some impressive concert footage. The sounds lack the pristine clarity of the best music DVDs, but they still translate well onto the small screen. The personal style would not have worked as well with an overly polished audio track. The conversations are also easily understandable, which leads to a stellar presentation. Extras Review: Tell Me That You Miss Me requires a commentary from Luna, and all four members of the band do appear to recall their experiences. Dean Wareham, Britta Phillips, and Shawn Eden join Director Matthew Buzzell in New York City to provide most of the track, with a few words from Lee Wall in Los Angeles interspersed. This discussion lacks energy at times, but it does offer some enjoyable tidbits. Buzzell notes the numerous moments where he used footage from venues different from the primary site being depicted. This happened often with crowd members who were especially pumped to see the band. Eden seems a little embarrassed by his extended stories and drunken partying, but he speaks honestly about each moment. Wareham seems uncomfortable in this setting, but he speaks the most and is rarely boring. They all seem genuine and enjoy recounting the experiences from the final tour. I had hoped to see more concert footage than the four extended performances included on this release. However, the tracks presented do showcase Luna at their best. The 22-minute section contains Friendly Advice from Austin, Cindy Tastes of Barbecue from Minneapolis, Bewitched from Barcelona, and Black Postcards from New York City. The last song runs for 10 minutes and is the most impressive due to an extended jam of rocking guitar solos. The other significant extra is a collection of 14 deleted scenes that gives us more interviews and brief moments from the tour. Especially stunning is Eden describing a brutal attack from an unknown assailant on the streets of his hometown. His injury occurred only two weeks prior to their Japanese tour and nearly curtailed the tour. Another worthy scene shows Rolling Stone's Joe Eden discussing Luna's connection to New York and their meaning for him. Many moments could be called throwaways, but I enjoyed seeing even more of the band in an array of situations. My single Luna concert experience occurred during the Romantica tour in 2002. They made an in-store appearance early in the day, and then played an excellent set that night at a local club. The band enjoyed the performance and delivered a great time to the sold-out crowd. Tell Me That You Miss Me: A Film About Luna serves as a fitting send-off to an original, talented group that charmed during its 12-year career.